Helinox Table One. Showing up with TABLE ONE HARDTOP is pure sophistication. It gives you a stable place for a couple plates and drinks without worrying about spills. An outstanding compliment to your beer cooler, just add chairs for a sit-down affair. 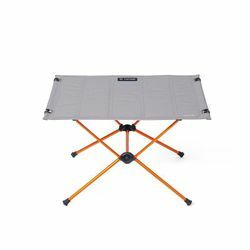 It features a lightweight (2.1 lbs), compact design (4.5”x 4.5"x 16" in its case) when packed away and is always just within reach when assembled (table height: 15.5”).